POINT PEDRO: Post-war Jaffna peninsula is witnessing a revival of interest in Mahatma Gandhi. While in his own native land people had ceased to put up Gandhi statues, Point Pedro in north Jaffna unveiled a brand new one at the centre of the town on October 2. 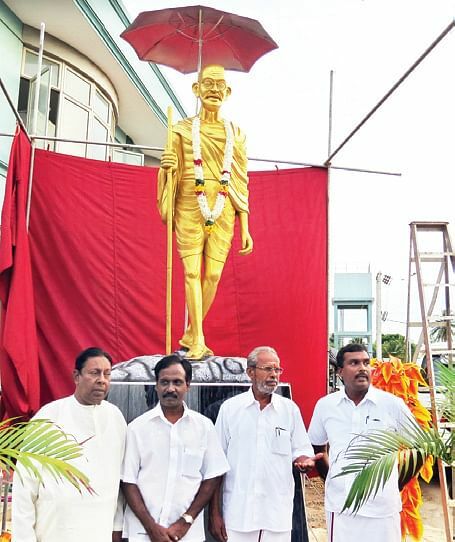 Erected by Jaffna’s Gandhi Seva Sangam, the statue was unveiled by the Acting Indian Consul General S D Moorthy before a gathering, including the Secretary of the Northern Provincial Council, C V Sivagnamam. In Jaffna, the Samgam released Gandhiam a monthly. Speaking at Point Pedro, Moorthy stressed the contemporary relevance of non-violence. “This statue is bound to evoke curiosity about the man and his mission,” he said. Sivagnamam recalled Gandhi’s visit to Point Pedro in 1927 and the impact he had. “Inspired by Gandhi, I went to school without a shirt on, and when the teacher reprimanded me, I asked if Gandhi could go about bare bodied, why couldn’t I?” Government official Jayaseelan said and read out a moving poem on the apostle of non-violence. Lankan Tamils, who used to consider India as their “Motherland”, have had a long association with Gandhi. It was at the invitation of Handy Perinbanayagam of the Jaffna Students Congress, that Gandhi visited Lanka. In his speeches, Gandhi skirted politics and dwelt on social issues which had, and still have, great political impact. He said spinning and wearing Khadi would bring the privileged nearer the poor and also appealed to them to eschew aspects of ancient culture which are unsuited to modern times.